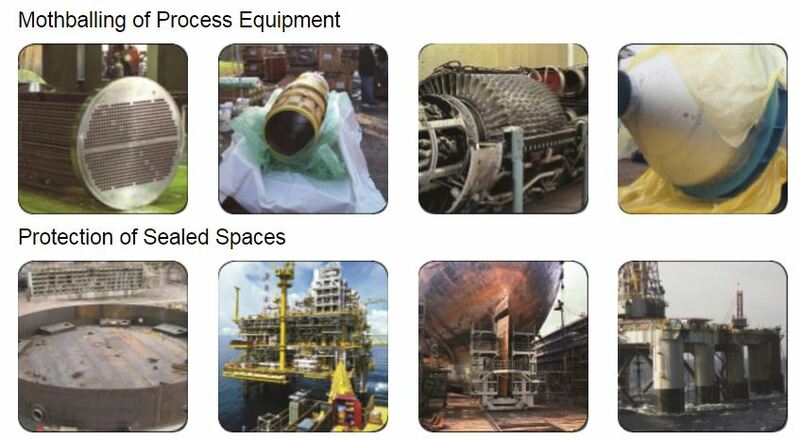 Offshore oil platforms, refineries, and other such facilities typically operate in a humid, aggressive corrosion environment. Corrosion of automation systems, electrical control boxes, retail fuel pump meters, connectors, contacts, relays, switches and printed circuit boards, causes unscheduled maintenance and reliability issues at these facilities. Few enclosures containing electrical equipment can be economically protected by air conditioning or a fully hermetic vacuum seal. Even explosion-proof housings aspirate ambient air through the long thread channel of the cast housings and by diffusion through seals and gaskets. Traditional protection methods such as painting, greases, electrical heaters inside control boxes to prevent condensation, etc. are not effective. Problems caused by electrical equipment corrosion include resistivity changes and intermittent contact failures in critical alarm and control functions, added local heating and power loss in critical components, solderability issues for circuit boards, changing the calibration of analog meters and, ultimately the integrity of cabinets are compromised. 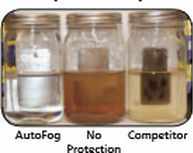 Determine the correct number of AutoFog packets needed to protect intended space. Do not overload protection. Remove from plastic packaging, but do not puncture product Place packet nearest to the center of the space as possible. If using multiple packets, distribute them evenly. Direct contact with ferrous metals is ok. Do not place in direct contact with yellow metals (brass, copper, zinc). Seal package or enclosure to contain vapor corrosion inhibitors inside.